The FieldLoad PRO is the first of a series of new and advanced machines that Tong is currently unveiling to the market, with a new, high capacity box filler being next in line and available to order in 2019. The suite of innovative new product launches comes as part of Tong’s continuous strive to offer the most advanced equipment with intelligent controls, minimal maintenance and maximum productivity in mind. “Our latest product launches are very much a result of our solutions-based design process in which we listen to our customers, and define emerging market demands, to develop new equipment that meets those demands within a cost-effective budget,” explains Edward Tong, Managing Director at Tong Engineering. “Our market leading EasyClean has been working in some particularly heavy soil conditions,” says Nick. 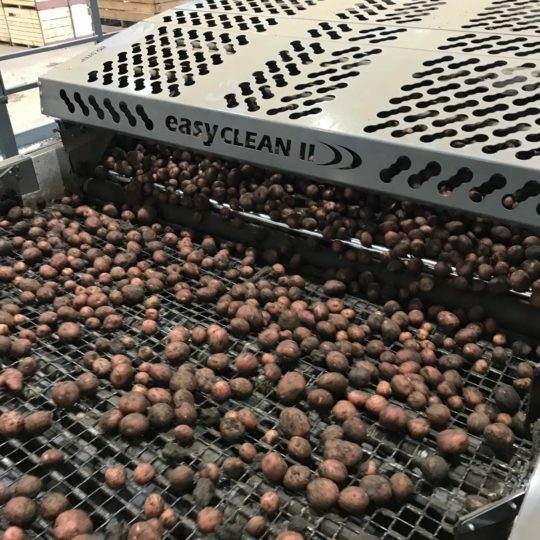 “The level of soil and haulm removal I have seen with the EasyClean this season has been remarkable, and one which many customers have once again reported as invaluable,” added Nick. For more information on Tong’s latest range of handling equipment visit www.tongengineering.com. Please don’t hesitate to contact Carole Metcalfe at Tong Engineering on 01790 752771, or email carole@tongengineering.com, for more details on this press release.